Public transportation seems to bring out the worst in people. Growing up in the U.S. with people in service roles bending over backwards to cater to customers’ every will in a strange cultural phenomenon called Customer Service, it can be hard to get used to the lack of customer service in European culture at first. Waiters aren’t as attentive, grocery store workers won’t offer to help you find what you’re looking for, and if someone thinks you are wasting their time, they will let you know with a sour look on their face – or they might even tell you so. I see nothing wrong with this directness – indeed, most of the Europeans I’ve talked to find it refreshing, and are instead distrustful of Americans’ fake smiles and over-friendly mannerisms. While I can’t say I prefer European culture, I respect it was a cultural difference that is – as my friend Tommy would say – neither better nor worse, just different. However, one cultural aspect I’ve noticed that I DO dislike is how it’s much more socially acceptable, or at least more common, to be completely rude to strangers. Now, #NotAllGermans are like this – I’ve met loads of really nice Germans who are perfectly capable of superficial politeness and passive-aggressive smiles. But already in my short time here, I’ve experienced or been witness to many unpleasant experiences involving usually-older Germans being incredibly and unnecessarily rude to other people, which shocked me as you almost never see that where I’m from. Example: I’m at the German embassy in Copenhagen to apply for a visa. I’ve just arrived in the city, am a bit flustered, and was definitely not expecting to have to speak German. Before I can do anything, I have to apply for a blocked bank account in which to deposit funds to prove I can support myself during my time here. It’s my turn in line, and the receptionist looks at me expectantly. I clear my throat and say, in German, “I would like to open a bank account. She looks at me like I’m stupid and says with acid in her voice, “We’re not a bank.” I’m speechless, and while I’m stuttering trying to explain, her colleague comes over and explains the blocked account and what is necessary to do to open one. She glances back at me and tells me to take a seat – no apology or anything – then moves on to the next person. Another time, I’m sitting in an U-Bahn (subway train. The next stop arrives, the doors open, and more people get in. A young man with headphones in sits down next to the door. An old woman gets on, looks at him, and says, “That seat is reserved for Behinderte,” using a not-so-politically-correct word for people of limited mental of physical capacity. He ignores her, and she sits down one seat over – there was plenty of space, it’s not like she had to stand. But instead of getting over herself, she lights in on the young man. “Can’t you see? That seat is meant for cripples! All the young people, they have no respect these days…” (I’m not even joking, she actually said that.) And when another man sitting next to her gently suggested that the sign was a big difficult to notice – being quite small, and well above eye level – she started in on him as well. The woman’s eyes hardened. “There’s a place free right there,” she said. Oh great, one of THOSE Germans, I thought, feeling my blood pressure rise. I rolled my eyes and sat in the next seat over. The old woman smiled at me and quickly set her little shopping bag on the ground to make room for me. Several minutes of tense silence ensued, the middle-aged woman and I avoiding each other out of our peripheral vision. I tried vainly to read an article on my phone, but couldn’t concentrate. After several minutes, she let out a low growl – I’m not even kidding you, she literally growled at me – in the back of her throat. Our stalemate over, I looked at her. “I don’t understand why your bags need a seat,” I retorted. The old woman got up. A young man sat down in her place. A minute later, a middle-aged man came over, pointed at the two handbags, and asked to sit down. The rude woman immediately removed them without complaint. A moment later, even though no train was coming, she got up and walked away. Go figure. Like I said, #NotAllGermans are extremely rude like this. But these incidents happen with such frequency as to be impossible to ignore, leading me to assume it must somehow be more culturally acceptable to behave like that here. Yes thank you for this post! 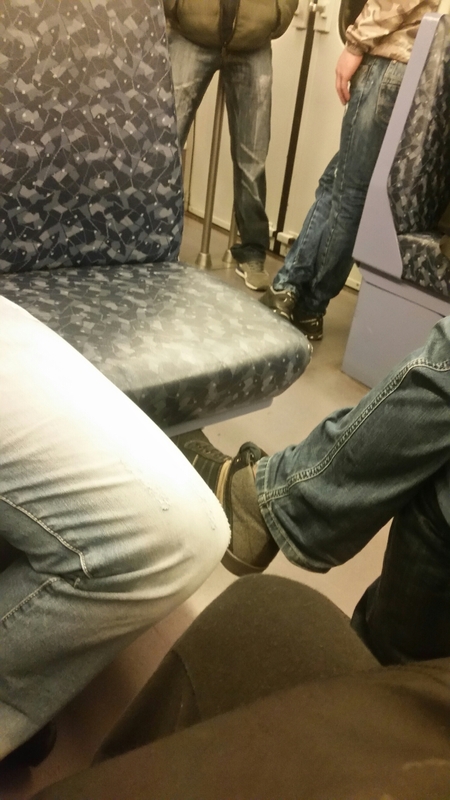 I’m so tired of people justifying the rudeness of Germans by saying they are “direct”, but directness has nothing to do with their absolute lack of manners in public transportation or their complete disregard to other people’s personal space. People will bump into you on the street and never utter a simple “sorry”, ever! They will just keep on walking, looking ahead of them like you don’t exist. They will eat smelly food in cramped trains. They will stare at you with dead fish eyes as if they’re bored and your face is the most entertaining thing they’ll see all day (this seems to be more of a Berlin thing than in other areas of Germany, though). They will literally RUN ahead of you to get to a queue just two seconds ahead. They’ll walk through doors and then let go of the the door in your face instead of holding it for you for a couple of seconds. I could go on and on. Yes, there are exceptions, but as a society they are incredibly selfish, inconsiderate and self-centered and I’ll be glad the day I leave this gray, miserable city. I lived in Germany for many years and I must say I’m glad I don’t live there anymore! I was just tired of being received everywhere with rudeness! You can be direct without being rude! Germans are direct and I don’t find that a bad thing but what I do find really bad is how rude they are! In cafés, restaurants, shops, metro, school… Everywhere you go you have to watch out because people will be rude to you. And the worst part is that they don’t even realize that this is not cool! They think its normal to act like that! I noticed that sometimes to not have this image of rude, some people try to be overly polite in a way that is clearly not natural! Its either 8 or 80! I’m really glad I don’t live there anymore! really really glad! I totally agree with you. Quite a lot of my compatriots have the habit to be rude, selfish and lack the minimal civilty necessary to create an atmosphere of ease and community. However, I hope you will also find people here in Germany that are polite and cooperative. As a side remark – in my opinion some Americans often overdo the politeness and friendliness in a way that appears a bit false. Still – the best way you show the world your teeth is to smile. Zyriacus – oh yes, don’t worry, I’ve met plenty of friendly and polite Germans as well. It seems to be a rather small segment of the population that behaves like I described, although since I almost never experienced things like that back home, it really struck me here. Interestingly, I have experienced some “American-style” over-polite customer service here too – once when I contacted my German health insurance company, and once when I opened a German bank account. I’m not going to lie, I really appreciated it, but I know there are lots of Americans and Europeans alike who prefer a more direct, honest form of communication. I want to distinguish the directness from the rudeness, too. I think directness is just a cultural difference you have to accept and neither culture is necessarily doing it “right.” But I do think the lack of manners I described in the situations above, when it was clearly unnecessary and making other people uncomfortable, is not good.